One of the biggest parts of our homeschool days with my littlest is reading good books. We love to explore new books and find new favorites. We were so excited to read That's (Not) Mine from the author of You are (Not) Small - one of our favorites! Two fuzzy creatures want to sit in the same comfy chair. The trouble is, they can't agree who it belongs to. You can purchase your copy of That's (Not) Mine at your local book retailer or at online stores like Amazon! My four year old loved this book. The story is simple but when you add the illustrations to the two fighting over a chair you get lots of giggles! 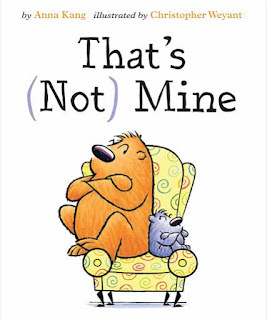 We were able to use the book as a teaching moment and talk about how the two friends were not being very friendly. It was an easy concept to grasp. Jace's favorite part was when the big guy crashes off the chair. As you can see from his face he thought that was very funny! One lucky reader will win a prize pack which includes the That's (Not) Mine Book & a poster! I love books! I would share this with my Kindergarten students! I would read this to my daughter! It looks so cute! I would read it to my grandchildren.